In the mountains of central Vietnam, a colossal pair of hands lifts a golden thread of walkway high above the clifftops, as if the mountain itself has sprouted limbs. "I feel like I'm walking on clouds," said Vuong Thuy Linh, a tourist from Hanoi. "It's so unique". Cau Vang or the "Golden Bridge" in Vietnam's Ba Na Hills has attracted scores of tourists since it opened in June, eager to see a novel piece of architecture famed for its unusual design. The pedestrian walkway, designed by TA Landscape Architecture in Ho Chi Minh City, sits at over 1,000 metres (3,280 feet) above sea level and extends over the treetops from the edge of a leafy cliff face, offering tourists uninterrupted views of the majestic landscape beneath. 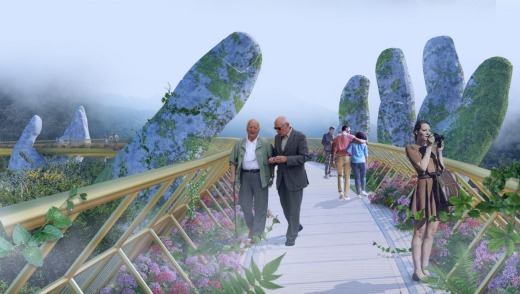 The bridge was designed to evoke the image of the "giant hands of Gods, pulling a strip of gold out of the land," said Vu Viet Anh, Design Principal at TA Landscape Architecture. 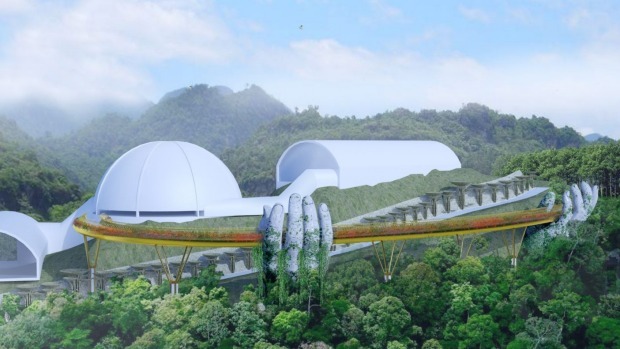 "It creates a walkway in the sky, among the foggy and fairy-like lands of Ba Na mountain," said Anh, who added that he had been surprised at the level of attention his firm's design had attracted both locally and internationally. The Ba Na Hills, a popular getaway for the French during the colonial occupation of Vietnam, received over 2.7 million visitors last year, according to the Vietnam National Administration of Tourism. 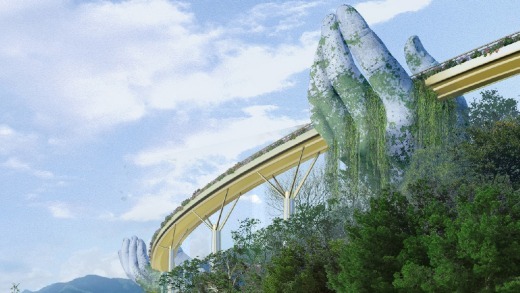 But it is the Golden Bridge and its supports - two huge stone-coloured human hands styled in such a way that it looks as if the jungle is struggling to reclaim them - which have garnered the most attention from visitors. "The two, smooth, giant hands look real," said Truong Hoang Linh Thuy, another tourist. "It makes me feel like humans can do anything".